community get togethers, and fundraising dinners. Thanks to all the volunteers who help make Elmwood sparkle! Thanks to all the organizations who supported greening and cleaning events last month and to the volunteers who planted more than 60 trees on residential streets in southern Elmwood, on Huntington Ave, and on Broad St. The trees on Huntington Ave are a first step towards redeveloping the roadway that leads from Rt 10 through the West End to Elmwood. Special thanks to Partnership for Providence Parks, the Providence Neighborhood Planting Program, the City’s Forestry Department, TD Bank’s Green Streets program contributed trees, tools, mulch, snacks, and guidance, and to Quisqueya in Action for organizing the Broad St planting and cleanup. Thanks also to Ward Weathers and 21 friends and neighbors who aerated and mulched 80 trees in Locust Grove Cemetery, the largest open space in Elmwood. In past years residents of adjoining properties bought and planted nearly 90 trees in the cemetery. Additional fruit trees were planted with the help of the City and more residents. Want to join in this effort? Park advocates and hands on volunteers are needed to care for this historic cemetery on a more regular schedule. It will be rewarding work as the trees grow and the fruit trees bear fruit. Contact Ward Weathers at weathersw@gmail.com to say you’re interested in becoming a Friend of Locust Grove. With two successful cleanups in April involving over 80 participants, both the garden and park are ready for their more active seasons. And yet, more improvements are on their way. The park will get new fencing this week; a newly donated exterior bulletin board will soon be installed; and Wheeler School students will help with other maintenance on May 11. Two notable projects are underway: The Y Youth Program on Broad Street will create a large mural for the park; and the Peace and Plenty Outside Art Gallery will open its first show this summer. Give your own street trees a hand up this spring by aerating and mulching them. Mulch left over from tree care in Locust Grove Cemetery is available at no charge to Elmwood residents. Just bring a shovel and container to the cemetery and collect mulch left behind in several piles. Find Rare and Unusual Plants for your gardens at City Farm’s annual sale on May 19 and 20. 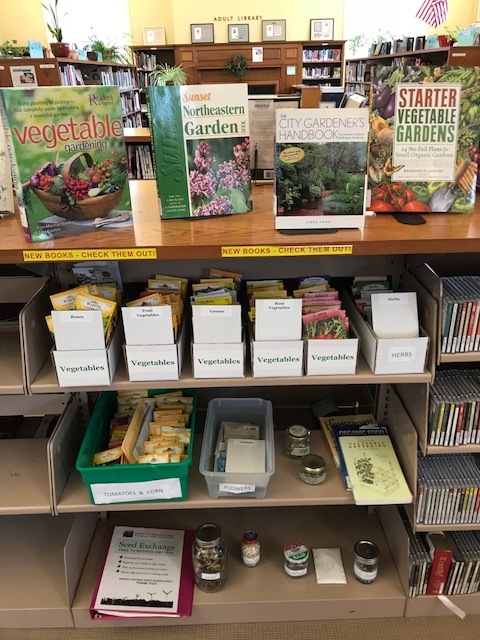 And don’t forget that the South Providence Library has launched its 2018 Seed Exchange program. Everyone is welcome to receive free seeds for a summer garden. Thanks to Ocean State Job Lot, URI, and local growers for donating seeds and to URI Master Gardener Program volunteers. We’re not finished greening yet! On Saturday, May 19 AARP RI sponsors a planter renewal project on Elmwood Ave. AARP is supplying ornamental grasses (and volunteers) to fill nearly 40 planters on the street. Join in! “Sit down with other diverse, engaged people and see what comes up—there’s bound to be common interests and healthy conversation.” RI Foundation has launched a series of 20 neighborly get-togethers called Together RI. Each session offers the chance for people to talk face-to-face with each other over family-style meals. The last of the series is in Elmwood at the Elmwood Community Center on Saturday morning, May 5. It’s a good opportunity to meet your neighbors. Join the Jane’s Walk festival on May 4, 5, and 6. Jane’s Walk is an annual festival of citizen-led walking conversations inspired by community activist Jane Jacobs. Jane’s Walks encourage people to share stories about their neighborhoods, discover unseen aspects of their communities, and use walking as a way to connect with their neighbors. Volunteers have led free walking tours in more than 200 cities around the world, including dozens in Providence.Thirteen walks are planned in Providence this weekend. Participate in free walking tours to explore different elements of the park. Find details of these and other park activities at the RWPconservancy.org. Note: On the first Saturday of the month, Providence residents get into the zoo, botanical gardens, and museum for free. The revitalization of Bomes Theater, a long abandoned theater on Broad St, will soon be underway! 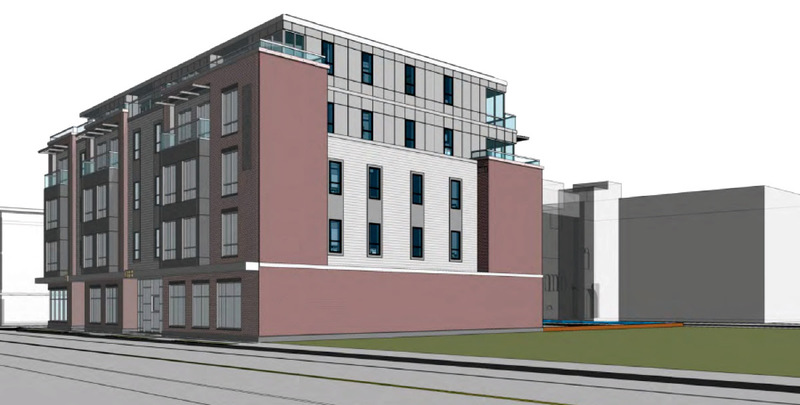 The Providence Redevelopment Agency (PRA) has worked to prepare the building for reuse by completely clearing out debris inside the building, completing a structural analysis of the building, and engaging a group of graduate students from Harvard University to assist in analyzing the best reuse options for the building and assisting in marketing the site. On April 20 the PRA signed a purchase and sales agreement with a local community member who will be renovating the building back to its original splendor as a community event space with two retail storefronts on the ground floor. The revitalization of the building is a great historic preservation success story, and returns the building back to being a vital and vibrant part of Broad Street and the neighborhood. A meeting on Monday, May 14 will address the impact on the neighborhood. A press conference will be held on Thursday, May 17. Jesus Tintin, the owner of Broad Street’s Mi Sueno nightclub has been a generous contributor to Broad St initiatives; but the noise from Sunday afternoon “Car Shows” at the club is intruding on the peace and quiet that nearby residents seek on their weekends. Tintin has appeared before the Board of Licenses twice in response to complaints about noise emanating from the events. Tintin has been asked to reduce the volume, decrease the event hours from 12-8 pm to 12-7 pm with music shut off by 6:00, and use a noise meter to monitor the noise levels. Police have been directed to measure noise at the properties of neighbors affected by the noise. BOL has also asked for clarification of a letter signed by Safety Commissioner Pare that seemingly gives permission for noise that exceeds levels permitted by the City’s noise ordinance. The next hearing will be on Thursday, May 10. In the meantime, The Jewelry District Association is holding a round table discussion onMay 8 to address the impact of Providence Night Life on residents. It’s a good opportunity to discuss these issues with another neighborhood group. Find general information about community groups, greening Elmwood, community policing, and city services in the ENA Reference Guide mailed in June, 2017. Tuesdays & Thursdays, 10:30 to 12:30; Wednesdays, 5:00 to 7:30. Libraries rely on Friends groups to advocate for library needs. The Friends of Knight Memorial run frequent book sales to raise money for library programs and are developing an online site for buying new books for the library. The May meeting will report on upcoming building improvements and address cooling issues during the coming summer. May 5, 10:30 to 12 – Trinity Square. Meet up at Southside Cultural Center parking lot and end at Sankofa Market’s season kickoff event. Led by long-time Elmwoodian Doug Victor. May 5, 1:00 to 2:30 – Experiencing Broad Street. Meet up at Parkview Café, 1228 Broad St. Led by Elmwoodian, architect, and RISD professor Jim Barnes. May 5, 3:00 to 4:30 – Discovering Roger Williams Park. Meet up at the monument to Roger Williams at the Park’s Elmwood Ave entrance. Led by Christopher Ackley, a memer of the Board of Directors of the RWP Conservancy. Bring your ideas to the table. Share a meal and conversation with other Providence residents as part of RI Foundation’s Together RI initiative. Sankofa brings fresh produce, crafts, a food truck, and more to Trinity Square. Note: Sankofa will pop up at the Southside Cultural Center from 11 to 3 on the 1st Saturday of each month and at Knight Memorial Library every Wednesday afternoon/evening from June 20 to October 31. Advisory board meets monthly to develop outreach efforts and define the direction of ENA. Jon will be preparing Peruvian taste treats so please RSVP to him and/or Paula in advance and ask for his house number. The Jewelry District Association invites the public to attend a round table discussion that includes Police Chief Hugh Clements, Public Safety Commissioner Pare, and representatives from the Board of Licenses, Responsible Night Life Organization, and City Council. Final planning for the revitalization of Elmwood Ave planters, scheduled for May 19. Report from a discussion with Paul M Farber of Philadelphia’s Monument Lab, a series of events that engaged residents in discussions about the city’s monuments. Note: EBCA meetings are held on the 2nd Wednesday of each month. Book dealers are invited to take a close look at 12,000 donated books and more. All dealers are welcome. Learn more: Follow us on Facebook or visit our website. Prior to the next BOL hearing, read the meeting minutes for reasons why the BOL has allowed car shows to continue at Mi Sueno through May 6. Listen to the audio tape of the hearing starting at about 1 hour and 15 minutes. Join the Friends of the Park and Wheeler School students for park maintenance. Bring your concerns about the development of Bomes Theater as an events center, including locations of parking. The new owner, Mr. Taveras and Rep. Grace Diaz will attend. Join Mayor Elorza, the PRA, the new owner of Bomes Theater, and other community and preservation leaders to celebrate! Join Dorcas International Institute of RI for an international culinary celebration to support our work and honor the vibrancy of RI’s diverse community. For this unique fundraising event, local chefs will recreate family dishes from around the world. Participating chefs represent Waterman Grille, Leon’s, El Rancho Grande, Laughing Gorilla, Troup, Jamestown Fish, Red Fin, Los Andes, XO Café, and more. Bike to Work Day is the origin of all National Bike Month events. Started in 1956, this day is a time to try out commuting to work by bike. This year there will be a big celebration in Burnside Park downtown from 7 to 9 am with free food, booths with community organizations, and a few special guests to applaud your bicycling efforts. There will also be bike trains coming into downtown from all parts of the city, so you don’t have to bike alone.Thanks to the City of Providence for helping make this event happen every year! Join us later in the day for the Bike to Work Afterparty! Southside Community Land Trust’s spring sale features hundreds of varieties of sustainably grown annuals, perennials, and fruit and vegetable plant starts – roughly 20,000 in all. Local performers entertain shoppers with live music. Experienced gardeners are on hand to answer your gardening questions. Proceeds support SCLT’s education and community outreach programs. Help AARP volunteers and the Elmwood Ave Business and Community Association (EBCA) renew the planters on Elmwood Ave with ornamental grasses. Planting will be followed by lunch at the church. Meet with Lt. James Barrows, who reports on incidents in the previous month. Talk face to face with the police commander to resolve quality of life issues. Note: Crime Watch meetings are held on the fourth Wednesday of each month. Crime Watch window placards are available at each meeting. West Elmwood Housing Development Corporation (WEHDC) is proud to host its firstSankofa Eats! – a series of community meals. The series is a way to gather community residents, allies, and business owners in support of transformative programming offered by WEHDC. Sankofa Eats! will be focused on improving nutrition and ways that individuals can receive access to local healthy foods. Our initial meal will celebrate the completion of our community kitchen and greenhouse. Michelle Tulloch, our chef of the evening is the creator of Eden’s Bowls, a business that offers meal prep and planning services based on a whole foods and a plant-based diet, and catering services. May features a great selection of books on gardening, nature, pet care, baseball, golf, boating, and Jewish experience at unbeatable prices, plus these fantastic discounts: Soft cover fiction, 10 for $1.00. VHS tapes, 6 for $1.00. Select LPs, 10 for $1.00. Select CDs, 4 for $1.00. Select DVDs, 2 for $1.00. With over 12,000(!) items in stock we are known for our quality and prices. Called “The best little book store in town.” Proceeds support our historic Knight Memorial Library. Book, LP, CD, DVD donations are happily accepted during open hours. Want to volunteer? Contact Doug at doug.crimewatch@gmail.com. Many neighborhood decision-making discussions have taken place in such meetings.Agendas are published at least 48 hours in advance of the meeting and are available athttp://sos.ri.gov/openmeetings/. Reach of the ENA monthly newsletter: 58 members of the Elmwood Exchange and 158 additional neighbors, city officials, and staff of community organizations. To unsubscribe from ENA mailings, please email Karen at karen_ena@earthlink.net. and to exchange ideas about improving the South Side. Invite your neighbors to join in! April 27 the City celebrates Arbor Day with a planting event on Huntington Avenue in the West End; and on Saturday, April 28 Providence celebrates Earth Day with a citywide clean up of green spaces and neighborhoods. In Elmwood we’ll plant trees on Broad St, clean up Locust Grove Cemetery, and freshen up Peace and Plenty Park. On Saturday, May 19 AARP joins neighbors to refresh planters on Elmwood Ave.
South Providence Library has launched its 2018 Seed Exchange program. Everyone is welcome to receive free seeds for a summer garden. Thanks to Ocean State Job Lot, URI, and local growers for donating seeds and to URI Master Gardener Program volunteers. “Sit down with other diverse, engaged people and see what comes up—there’s bound to be common interests and healthy conversation.” Rhode Island Foundation has just launched a series of 20 neighborly get-togethers called Together RI. Each of 20 sessions offers the chance for people to talk face-to-face with each other over family-style meals. The series runs from March 21 through May 5 at a various locations around the state. In Providence share dinner and conversation at Providence Career and Technical Academy on Tuesday April 3 and at the Elmwood Community Center on Saturday morning, May 5. Jane’s Walk is an annual festival of citizen-led walking conversations inspired by community activist Jane Jacobs. Jane’s Walks encourage people to share stories about their neighborhoods, discover unseen aspects of their communities, and use walking as a way to connect with their neighbors. For several years, a diverse group has led free walking tours in more than 200 cities around the world, including many in Providence and our own neighborhood. The next Jane’s Walk festival weekend is May 4, 5, and 6. Contact Joelle Kanter, joellekanter@gmail.com with your ideas about leading a walk. In a March 20 article, RI Monthly called South Providence a “Mecca for Dominican-American Industry” and highlighted several restaurants and businesses in the area. On March 23 ONE/NB held an open house for the new Elmwood Financial Center. The center at 770 Broad St offers homebuyer education classes, financial counseling, and more on Tuesdays and Thursdays from 9 am to 5 pm. Clients don’t need an appointment to get their questions answered. Financial support for the center comes from Bank Newport, The Washington Trust Company, Bank RI, and Coastway Community Bank. Looking for activities for school vacation? The Botanical Gardens at Roger Williams Park hosts Fairy Garden Days from April 14 to April 29. The Museum of Natural History hosts Mission Space Week fromApril 16 to April 20. Find details about these and other park activities at Roger Williams Park Conservancy events calendar. Note well: On the first Saturday of the month, Providence residents get into the zoo, botanical gardens, and museum for free. According to several U.S. mayors who are ready to pass gun control laws, the NRA and state legislatures stand in their way. USA Today has reported that forty-three states have passed some form of gun preemption laws, a tactic increasingly used by state legislators to prevent cities and counties from making local laws and decisions. If citizens want safer cities, they may first need to target state legislatures that stand in the way of local restrictions on guns. On Thursday, March 29 The Board of Licenses heard a complaint about noise emanating from Mi Sueno “Car Shows” on Sunday afternoons. The BOL is permitting the car shows to move forward with music in April. However, they asked the owner, Jesus Tintin, to reduce the volume, to decrease the event hours from 12-8 pm to12-7 pm with music shut off by 6:00, ordered him to monitor the noise levels with a noise meter, and directed the police to measure noise at the properties of the neighbors who are upset about the noise. Bring your ideas to the table. Share a meal and conversation with other Providence residents as part of RI Foundation’s Together RI initiative. Every event is free and open to the public. Libraries rely on Friends groups to advocate for library needs. The Friends of Knight Memorial run frequent book sales to raise money for library programs. They are also working to increase the numbers of people with library cards. Advisory board meets monthly to develop outreach efforts and define the direction of ENA. For more information, contact Paula Donovan, paula.on.lenox@gmail.com or Karen Hlynsky, karen_ena@earthlink.net. Reception and concert by guitarrist Juan Falú, an outstanding artist of the past several decades from Argentina. Juan Falú is the creator and director of the festival “Guitars of the World” now on its 23th version, considered the largest international event in its genre. Plan for the revitalization of Elmwood Ave planters, scheduled for May. Learn about Philadelphia’s Monument Lab, a series of events that engaged residents in discussions about the city’s monuments. It’s time for another Street Tree Planting in Elmwood, and we need your help! Gather at Sackett St School for a planting demonstration and then help plant 31 trees on Gallatin, Kipling, Lenox, Sackett, and Warrington Streets. See a map of the planting at this Google maps link. The planting will take about two hours. Please plan to attend this fun event. Invite family, friends, neighbors, students, and others. Work with us to build our community through the simple and rewarding task of planting a tree. And help make Elmwood, and all of Providence, a verdant place. Wear closed-toed shoes and gloves. Bring shovels and brooms. Made possible through a street tree award granted to our neighborhood by the Providence Neighborhood Planting Program! After planting trees in the neighborhood, stop by the library to find books on nature and gardening. Prepare for summer vacations with international travel books and books on other summer activities. Find books for putting your finances in order. And get great deals on paperbacks – just 10 for $1.00! Provide input on City Walk, a project that will connect neighborhoods, make it safer to walk and ride bicycles, and celebrate our city! Learn about plans for Clifford Street downtown, the Clifford Street bridge over I-95, and Pine and Friendship streets in Upper South Providence. Then work with us to come up with your own plans for Broad Street. We’ll have a special (and very fun!) interactive design kit available at the meeting so you can show us exactly ​how you would redesign Broad Street. Community members will also work with us to decide how to ​apply these design ideas to a demonstration project that will temporarily transform a small segment of Broad Street ​this summer ​using traffic cones, temporary paint and planters, and other ​low-cost ​​materials for all to see and experience. Spanish interpretation will be available. For more information, contact Alex Ellis, at AEllis@providenceri.gov, 401-680-8400, or visit the project website at www.providenceri.gov/planning/citywalk. Get free veggie seeds and organic compost at one of four community gardens in Providence, including the one at Davey Lopes. The event is hosted by the Southside Community Land Trust and the Providence Community Growers Network. Join gardeners in compost delivery, sprucing up the garden and its environs. This is a good opportunity for potential gardeners to see the garden and new tool shed. We have only a few plots left if you want to garden this season. Snacks provided. Contact: Doug Victor at doug.crimewatch@gmail.com or just come. Latinos in Heritage Conservation are hosting their third national event–this one in Providence. 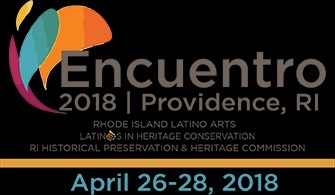 Encuentro will bring together preservation thought leaders, scholars, students, and community advocates from all over the country for an unprecedented discussion of the value and future of heritage conservation in New England’s Latino communities and beyond. The event is presented in partnership with RI Latino Arts and the RI Historical Preservation & Heritage Commission. The City of Providence Forestry Division and the Providence Neighborhood Planting Program will be hosting the City’s Arbor Day Tree Planting Event. The event will kick off a planting and greening project that will evolve over 6 months. Funded through a TD Bank Green Streets Award, the project is a collaboration among Groundwork RI, Amos House’s “A Hand Up” Program, the Elmwood Neighborhood Association, Friends of Bucklin Park, the Gilbert Stuart Middle School Garden Club, and Johnson & Wales ecology students. More information and details will be coming soon. In the meantime, community members who are able to join in on Friday, please put this event on your calendars! It’s a chance to bring some much-needed TLC to this neglected, but prominent stretch of road that connects Rt 10 to our neighborhood! Training, demonstrations, lunch, and the opportunity to get-your-hands-dirty will all be provided! For more details as they unfold, check www.pnpp.org, or call (401) 368-5380. Join one of the many community groups cleaning up a park, planting trees or beautifying a neighborhood! Volunteers will receive a 2018 Earth Day Spring Cleaning button, good for free admission to venues in Roger Williams Park, discounts, and free stuff at select businesses. RIPTA will also offer volunteers free rides all weekend. 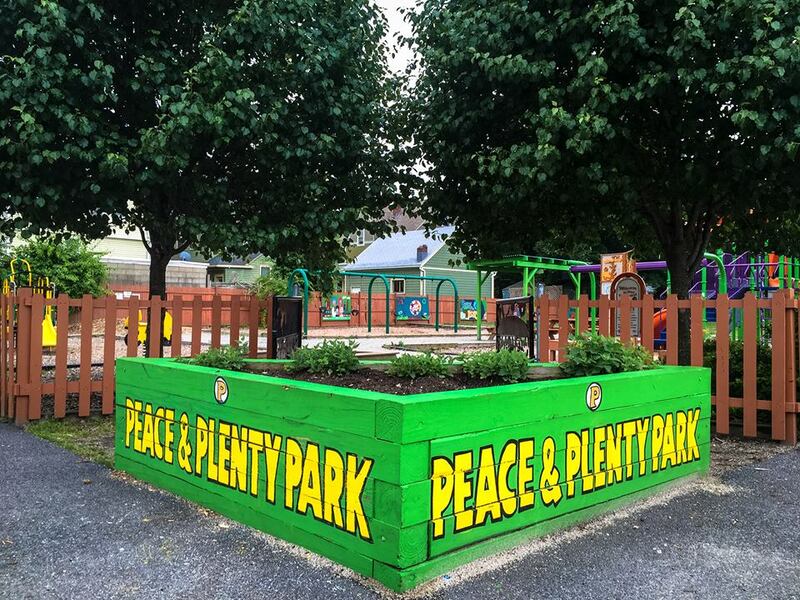 Join the Friends of Peace and Plenty Park and Charter Care Rhode Island to spruce up our northern Elmwood neighborhood park!. There’s lots to do, including weeding gardens and walkways, mulching, tree care, and sign painting. For details contact Marilyn Cepeda, marilyncepeda908@gmail.com or check http://pnpp.org/tree-planting/neighborhood-awards/. Work side by side with your neighbors to give some sorely needed attention to the largest green space within the Elmwood Neighborhood borders! Volunteers will do litter patrol, aerate tree roots, and spread mulch around the trees. Wear comfortable work clothes, and bring rakes, mulch shovels, and hand cultivators. We will have some tools on hand but bringing your own greatly helps. If you have a wheelbarrow to bring (or simply loan us for the event), please contact Ward Weathers weathersw@gmail.com. This event is part of the City’s Earth Day celebration in conjunction with the Providence Neighborhood Planting Program and its Providence Citizen Foresters effort. It’s also, in part, an effort to re-boot the Friends of Locust Grove Cemetery, and we cannot do it without your help. If it bothers you to see a neglected green space in our neighborhood, then join us to transform it into the beautiful green space it once was and can be again. This summit will provide residents of South Providence and the West End the opportunity to identify neighborhood assets, obtain additional information on housing & social services, & provide solutions to address housing challenges in our neighborhoods with the immediate intention to create a common housing agenda. There is no cost to attend this event but please register. Register on Eventbrite.com. Find the event by searching “Neighborhood Housing Summit”. Jane’s Walk encourages people to get out and explore their neighborhoods. Providence is one of more than 200 participating cities around the world. TheProvidence page is under construction. For now, please like the Jane’s Walk Providence Facebook page and find more information on Eventbrite. As the weekend approaches, find details about individual walks in RI at the Jane’s Walk website. Bring your ideas to the table. Share a meal and conversation with other Providence residents as part of RI Foundations’s Together RI initiative. With over 8000(!) items in stock we are known for our quality and prices. Called “The best little book store in town.” April features gardening, nature, baseball, golf, boating. Paperback fiction–just 10 for $1.00. LPs–10 for $1.00. Select CDs and videos also priced to move. Proceeds support our historic Knight Memorial Library. Many neighborhood decision-making discussions have taken place in such meetings. 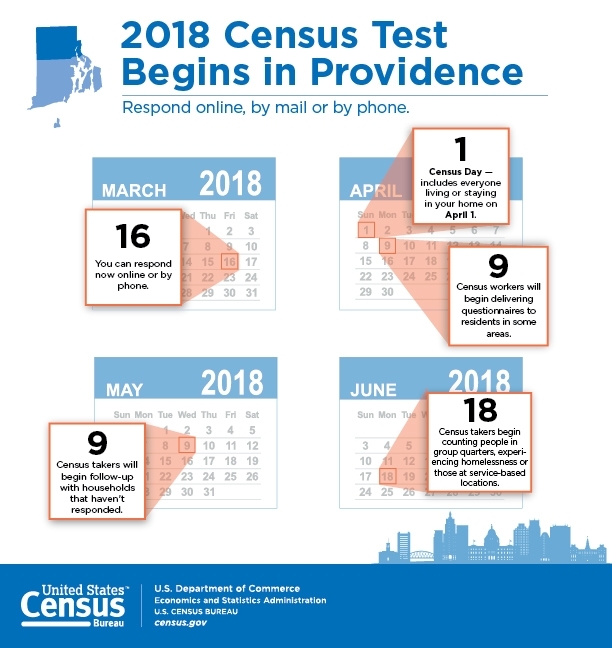 Agendas are published at least 48 hours in advance of the meeting and are available at http://sos.ri.gov/openmeetings/. Jane’s Walk is an annual festival of citizen-led walking conversations inspired by community activist Jane Jacobs. Jane’s Walks encourage people to share stories about their neighborhoods, discover unseen aspects of their communities, and use walking as a way to connect with their neighbors. For several years, citizens have led free walking tours in more than 200 cities around the world, including many in Providence and here in Elmwood. The next Jane’s Walk festival weekend is May 4, 5, and 6, 2018. Contact Joelle Kanter, joellekanter@gmail.com, with questions about leading a walk. She’ll schedule individual calls or meetings in March, and plans to bring all walk leaders together for a group meeting in April. Find more information on the Jane’s Walk Providence Facebook page and Eventbrite. Clark Schoettle, PRF’s Executive Director since 1983 is retiring. He has built PRF into a $12 million historic properties loan fund that has financed many rehabilitative repairs to residences in the Southside and other parts of the city. Thank you, Clark, for improving the quality of life in our city neighborhoods. Want to learn how to dance, paint, and drum? We’ve got that! Located in Trinity Square, SSCC offers a variety of classes and workshops from Tai Chi on Saturday morning, Caribbean rhythms percussion on Sunday afternoon, contemporary dance on Tuesday evening, and West African Drumming on Thursday evening. Check out their schedule to learn more. Have something you’d like to teach? Contact Yon Tande, 401-228-3630, yontande@sccri.org. Come mingle with like-minded artists and nature lovers at the Botanical Center on Friday afternoons. Guests are welcome to bring a sketch pad, water colors and washable paints and to take photographs. Get details on the RWP Conservancy Events Calendar. Sophia aims to change the lives of girls from low income homes through an empowering middle school education.Call or visit the school at 582 Elmwood Ave to request an application form, or download the Sophia Admissions Application from the Web site. To learn more call 401 784-0021 and visit Sophia Academy. In the wake of the Parkland Florida shootings RI has joined New Jersey, New York and Connecticut to take action on gun violence. Among its goals, the “States for Gun Safety” consortium aims to trace the sale and use of out-of-state guns in crimes and share information about individuals disqualified from possessing a firearm. The governors of these states have also announced plans to open what they say will be the nation’s first Regional Gun Violence Research Consortium. (Federal regulations currently prohibit the Centers for Disease Control from studying gun violence.) They are considering organizing the consortium through their respective state universities. Reminder: There have been a few instances of persons being victimized when selling items online or through social media. When buying or selling an item on line, consider meeting the purchaser (or seller) in a well-lit, safe public place, for example, the police station lobby during daytime hours. To read about recent crimes in Elmwood, contact Doug, doug.crimewatch@gmail.com to get on his mailing list. 1) Stores and restaurants would not be allowed to give away single-use plastic bags, starting in a year. 2) Stores will actually make money by selling brown paper bags and reusable bags for 10 cents each, whereas now they give bags away for free. 3) Stores will still be allowed to give away plastic bags for meat, fish, produce, and dry cleaning. Note: City Council meets on the first and third Thursday of each month. Join Moses Brown students to care for the library’s gardens and trees in the front lawn. The library needs you. Libraries rely on Friends groups to advocate for library needs. The Friends of Knight Memorial run frequent book sales to raise money for library programs. They are also working to increase the numbers of people with library cards and planning activities for school breaks. Join quarterly community meetings to hear about efforts to improve and preserve Roger Williams Park, presented by the Roger Williams Park Conservancy in partnership with the Providence Parks Department. Quarterly meetings in 2018 will be held on June 26, September 25, and December 11. For more information, visit www.RWPConservancy.org or email Info@RWPConservancy.org. South Providence Neighborhood Association invites neighbors to provide feedback on Phase I of the City Walk project, ask questions, address their concerns about the impact of City Walk on our neighborhood. Representatives from the City of Providence will also discuss the City’s Master Bike Path Plan. Lastly, representatives from the RI Division of Statewide Planning will present information on Moving Forward RI, a proposed idea that incorporates bikes in a statewide initiative for mass transportation. Learn about the current activities and future endeavors of the Southside Community Land Trust (SCLT). Is there such a thing as too many books? Actually, yes! The Friends of KML have run out of storage space. Help clean out our stock at half price sales throughout March. Prices of all books, LPs, CDs, DVDs and more are reduced. Mass market fiction (paperbacks) are just 4 for $1.00! In observance of Women’s History month and international Water Day, March sales feature women’s history/experience and boating. With over 4000 items in stock, we are known for our quality and prices. Called “The best little book store in town.” Proceeds support our historic Knight Memorial Library. Want a Community Garden plot for the 2018 Gardening Season? Plots are available at Peace and Plenty Community Garden in Elmwood. Grow your own veggies and be a part of the vibrant gardening community here in Elmwood. Thanks to the New England Grassroots Environmental Fund, we built a new tool shed last season that is stocked with tools and supplies for gardener use. Contact Doug at doug.crimewatch@gmail.com for information. Want to join the Friends of Peace and Plenty Park? There’s lots doing at the park that needs your involvement. Join the conversation and become part of the team. ONE Neighborhood Builders is happy to announce the opening of the Elmwood Financial Center (EFC): a one stop, drop-in center for financial literacy coaching, homebuyer education, & resources for setting and reaching financial goals. Located at 770 Broad Street in Providence, the Elmwood Financial Center is a place where people can find answers to common financial questions and strategies for saving, budgeting, and investing in a home. The EFC will be open Tuesdays and Thursdays from 9am-5pm starting on February 1st, 2018. If you’re interested in learning more, please visit the center, give our HUD certified housing counselors a call at 401-351-8719 or visit our website www.oneneighborhoodbuilders.org. It’s admissions season at Montessori Community School of Rhode Island. MCS RI is a socio-economically diverse early childhood school serving children 18 months- 5 years old. We offer quality Montessori classrooms on the South Side of Providence, focusing on children’s creativity, independence, and care of self. The MCS RI curriculum reflects our core mission of building community, social justice, and socioeconomic & cultural diversity. To learn more contact Amy Borak, aborak@mcsri.org or visit our website at www.mcsri.org. MCS RI is now accepting applications for 2018-2019. Sophia Academy is also accepting applications for the coming year. Sophia aims to change the lives of girls from low income homes through an empowering middle school education. Call or visit the school at 582 Elmwood Ave to request an application form, or download the Sophia Admissions Application from the Web site. To learn more call 401 784-0021 and visit Sophia Academy. Born out of a series of community summits hosted by the Providence Children and Youth Cabinet’s (CYC) Community Partnership, N4R addresses the issue of blighted, abandoned properties across the Southside and West End. N4R works with residents, community-based organizations, and other key stakeholders to develop a comprehensive, community-based strategy for resolving the large number of “problem properties”, which threaten the social and physical well-being of our neighborhoods. Paula Donovan has been representing Elmwood at these meetings since the group was formed. She has shared a list of over 100 properties in Elmwood that she has scored as being in fair, poor, or substandard condition. Some have been abandoned or neglected for years! (Just look at 91 Niagara, 226 Sackett, or 251 Lenox as long standing problem properties.) If you are interested in seeing this list, please send an email to paula.on.lenox@gmail.com. Any help you can offer to keep the list updated will be much appreciated! The N4R team is sustained through a formal partnership with the West Elmwood Housing Development Corporation and volunteers. We collect data about properties at risk and meet with representatives from various city departments to identify which are of immediate concern and may qualify for appropriation under one of the City’s programs. To learn more follow us on Facebook or visit our website. The N4R team meets on the second Wednesday of each month. See the schedule below for meeting details. Despite a lengthy library closing in 2017, book sales generated $5000. Nearly 2000 volunteer hours contributed to the sorting and sale of donations. There is now so much stock to share with our neighbors that all sales in February will be 50% off. There are additional opportunities to buy in February: Tuesday and Thursdaymornings from 10:30 to 12:30, Wednesday evenings (Feb 14, 21, and 28) from 5 to 7:30, and Saturday, February 10 from 10 to 1:00. Friends of Knight Memorial Library and other volunteers planted 400 tulip and daffodil bulbs in the front gardens and tree wells of the library. Spring will be an extravaganza of blooms thanks to volunteers and the Peace Flag Project of RI that donated the bulbs. AARP is asking for our help in distributing CARE Act flyers and posters throughout our community. The CARE Act, effective in March 2017, mandates that hospitals 1) record the name of the loved one’s family caregiver when the loved one is being admitted to the hospital; 2) informs the family caregiver when their loved one is released; 3) provides caregiving instructions to caregiver. We continue to reach out to caregivers and loved ones to educate them about the law. If you are able to help distribute wallet cards or posters about the law, contact Darlene Reza Rossi at drezarossi@aarp.org. An AARP representative will be at the next Crime Watch meeting on February 28. Join the Director of Providence Parks, Wendy Nilssen for a trail run at Roger Williams Park on Wednesday mornings at 6:00 am. Meet at the Dalrymple Boathouse and run the Big Lakes Trail, 3.2 miles at an easy pace. Post-run breakfast cookies will be provided. Spring is just six weeks away. It’s not too early to apply for a garden plot at Peace and Plenty Garden. Grow your own veggies and be a part of a vibrant gardening community. Contact Doug at doug.crimewatch@gmail.com for information. RI Coalition Against Gun Violence is a coalition of almost 100 partner organizations whose memberships include more than 120,000 Rhode Islanders united in the effort to reduce gun violence. The coalition is going to come out strong in 2018, fighting to keep guns out of RI K-12 schools and to ban high capacity magazines and military style assault weapons in Rhode Island. Find general information about community groups, greening Elmwood, community policing, and city services in the ENA Reference Guide mailed in June. Advisory board meets to develop outreach efforts and define the direction of ENA. An assessment of road safety along Elmwood Avenue (US Rt 1) from Carter Street to Linden Avenue (northern entrance to Roger Williams Park). The RSA team plans to follow this schedule: 10 am, meet at Walgreens; 10:10, Carter St; 10:25, Adelaide Ave; 10:35, Sackett St; 10:45, Cadillac Dr, 10:50, 1-95 ramps; 11:00, end of RSA. Please bring a safety vest if possible. Contact Traffic Engineer, Skye Levin, 401 457 7803, SLevin@VHB.com to get crash diagrams for this segment of Elmwood Ave. This is the 2nd workshop hosted by SPNA and SWAP that provides an opportunity for residents to speak directly about the Barbara Jordan II housing developments in Upper South Providence. Providence Community Library’s Maintenance Supervisor, Mike Nickerson will explain the assessment of the building. Note: Friends meetings are held on the second Tuesday of each month. We are reopening the Saturday Book Sale after a 7 month hiatus. During that time we’ve accumulated so many books that we’re offering everything in stock for ½ off our already outrageously low prices. Please note the new hours! Participants at the January meeting discussed next steps for beautification of and programming for Columbus Square. In February we continue that work, meet Adela Goldbard, Assistant Professor at RISD, whose class is working on socially engaged public art. AARP RI will present AARP’s framework for building livable communities via its presence in the Southside and discuss the new CARE Act that passed into law last year. Browse through 1000’s of sorted and categorized books. See what’s new in the children’s area. Stock up on videos and DVDs for the long winter nights. Earnings support library programs.